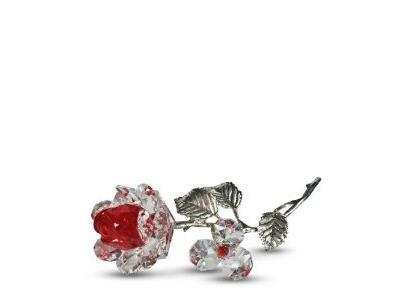 Say "I love you" without words when she receives this unique red crystal rose with pewter stem and leaves. Nothing says "I Love You" like the rose. Measures 4 3/4" long, 1 1/2" wide. This Crystal Red Rose is handcrafted of 24% lead crystal. Lead crystal is made from a mixture of sand, potash, and lead oxide. Crystal offers a striking harmony of colors and light, creates amazement by its brilliant reflections and displays the colors of joy to crystal lovers.